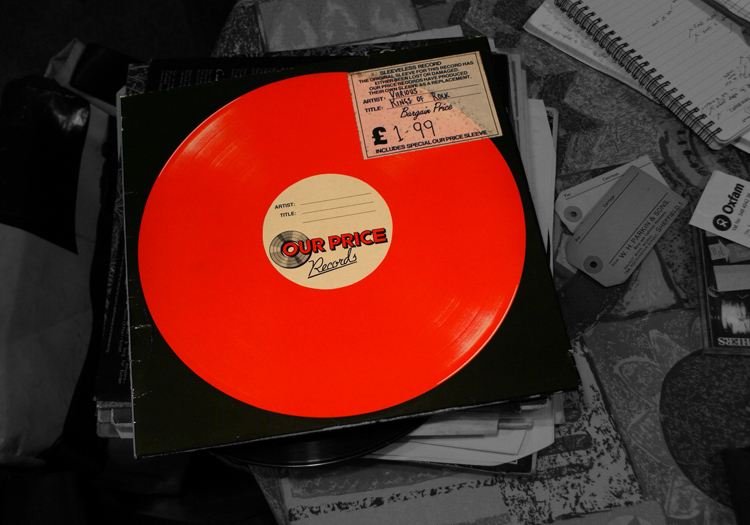 Opened back in 1972, Our Price Records disappeared from UK high streets in 2004, a typical story of a strong brand being mishandled once it had been floated on the stock exchange in 1984 (the last foreign owner apparently spent £8million rebranding the chain, then realised people preferred the original name and tried to relaunch it, by which time it was close to collapse). They were at one time the biggest rivals to the HMV chain. But here we have an ephemeral reminder of the shops, an Our Price branded ‘lost stock’ sleeve, printed in the red and black colours of the chain’s logo. Before shops began racking out records in sleeves, the discs were normally stored behind the counter. Sleeves sometimes went ‘walkies’; kids wanted them for their wall, or they might get damaged. These days of course such orphaned discs would just get binned, but back then shops used to sell them off at a discount. With 300 shops by the early 1990s, Our Price clearly had so many sleeveless discs that they decided to print a generic cover to house them. A small reminder of the day to day workings of a record shop. 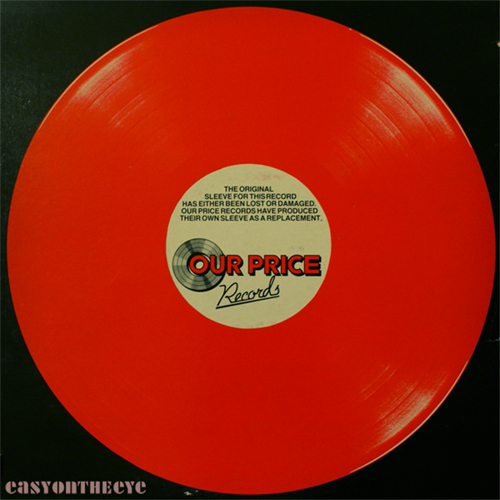 “Our Price Records have produced their own sleeve as a replacement” explained the back cover. They even added on the sticker that the sale price included the cost of this special Our Price sleeve! The coda to the story is that having walked off with the sleeve, the patient but poverty stricken music fan would wait for the sleeveless disc to turn up cheap in a bargain rack and be able to reunite it with the sleeve. I’ve since found the same sleeve in reversed colours, and a couple more such covers, which are on page two. 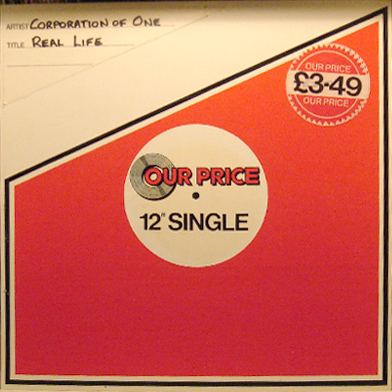 Our Price also produced a similar cover for 12″ singles, which enabled them to give customers information about the disc inside. I found a snap of one of these on the web. Sometime in the late 1990s/early 2000, the Our Price store in the Pentagon shopping centre, Chatham, had a sale of their “lost covers” stock. The shelves were filled with albums etc., with the (generic) covers you showed. I asked a assistant where they came from, and it seems the company had gathered them from other branches. Needless to say the store was packed solid with bargain hunters, all shuffling along a rack at a time, with the regular call “anyone seen any (insert artists/title here). It was only open for one weekend so if you missed what you wanted or changed your mind, back to the end of the line. This was one of two times I wished I had unlimited cash (with reference to records). I spent a whole weeks rent on them (landlord not pleased but hey), some of which I have still got. After the sale was over the remaining stock just vanished from the shop, I guess they moved onto another store, as I don’t believe they could have sold all the albums in two days (there were thousands). Thanks Steve, never saw a mass sale like that round our way! Generally the local branches just stored their own sleeveless discs up and had a sale once a year or so. There was a rumour at school that it was worth nicking sleeves from Bradleys Records in town, and then wait for the sleeveless sales there so you could reunite them with the discs cheaply.